Most of you already know that my 21-mile experience was not necessarily the greatest; it was a little more unfortunate than last year. Our team bus broke down and there were no water stops because we were late. I had no money on me to purchase reinforcements along the route, so you can probably imagine how this played out. I had a draft written a couple of weeks ago that brought you a step-by-step account of the day, but instead, I’ve decided to tell you what I learned from all this. Deodorant should NOT to be used in lieu of body glide. It does not work. Your bum WILL chafe. It is not a good idea to get your eyebrows waxed the day before a long run… you’ll understand when the sweat starts dripping down your forehead. Faucet water from the bathroom hydrates just like the bottled stuff, even though it tastes like…er…faucet. 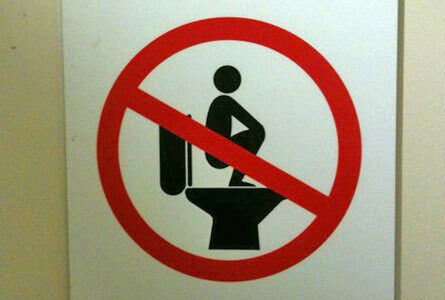 Make sure the toilet flushes BEFORE you go. Also, be sure to prepare your toilet paper pre-squat. The less time you spend in the squat position, the less painful your bathroom experience will be. Apparently, magnesium citrate isn’t the only thing that can cause the Hershey squirts… see #5. W(h)ine is meant to be consumed by glass… not spewed out of the mouth in the opposite direction.